Come and see this beautiful and historic church which is a Grade 2* listed building (as is St Peter’s at the bottom of King Street). On Tuesday mornings coffee and tea available in the church hall. We meet every Sunday throughout the year at 8.00am and 10.30am. There is also an evening service at 6.30 on the first Sunday of each month and a weekly service of Holy Communion every Wednesday at 10.30am. You are warmly invited to join us. At 10.30am on Sundays there are different types of service each week. Some are planned with children in mind but children are welcome at all our services and no-one minds if small children sometimes make a noise! Please note that at Christmas, Easter and other special seasons there may be variations to this programme. You can find details of this month’s services on the Calendar page and further information about the church and all our services in Contact the church magazine. 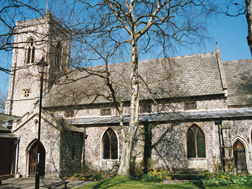 You can find St Cuthbert’s Church in Well Street at its junction with King Street, right in the heart of Thetford. (All the car parks in Thetford are free.) It is one of only 2 churches in Norfolk dedicated to St Cuthbert. You can read about St Cuthbert on the Who was Cuthbert? page, by clicking the link on the above.